Chico “Avenues” income property. The property includes two detached 1 bedroom units on one parcel. Each unit is rented for $550 per month. The property has 2 electric meters, 1 gas meter, 1 electric meter & 1 water meter. 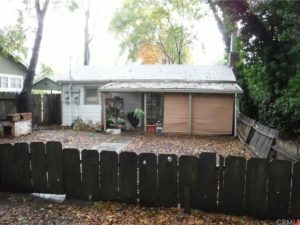 According to an appraisal on file, the property was appraised as two units and the appraisal states, “the subject’s second dwelling unit was legally recognized by the City of Chico.” Buyer to investigate to their own satisfaction any and all property conditions.